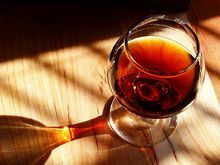 Port wine (also called Vinho do Porto, Oporto, Porto, and often simply Port) is a Portuguese wine. It comes from the Douro Valley in the northern provinces of Portugal. Porto is a fortified wine. This means that alcohol was added to it to make it stronger. Porto is a sweet wine, but comes as dry or semi-dry too. It is often served as a dessert wine. Wines which are similar to the Portuguese product called port are made in several countries around the world. The biggest producers are Australia, South Africa, India, Canada and the United States. However, under European Union guidelines, only the product from Portugal may be labelled as Port. In the United States, Federal law mandates that the Portuguese-made product be labeled Porto or Vinho do Porto. Port is produced from grapes grown and processed in the Douro region. The wine produced is then fortified with the addition of a Brandy (distilled grape spirits). This is done to stop the fermentation leaving residual sugar in the wine and to increase the alcohol content. The wine is then stored and aged. For aging, it is often put in barrels stored in caves (Portuguese meaning "cellars") as is the case in Vila Nova de Gaia. After aging, it is bottled. The wine received its name, "Port," in the second half of the 17th century from the seaport city of Porto at the mouth of the Douro River. Much of the product was brought there. It was then either sold on a market or exported to other countries in Europe. The Leixões docks were used for this. The Douro valley where Port wine is produced was defined and established as a protected region, or appellation in 1756. It is the oldest defined and protected wine region in the world.